Should you be fortunate enough to make a voyage on this magnificent ship, you doubtless will, as others have done, regret its conclusion. Day 3: The foredecks are closed, foreshortening our daily exercise walk. Our ship is skirting the remnants of Hurricane Nicole, winds gusting 45-60 mph. Below, near the waterline on the second deck, dark waves roll into aquamarine blues. Exploding into spumes of white, they reach 18 feet above their troughs. The horizon line seems a sawblade with broken teeth beneath a benign, powder-blue, cloud-strewn sky. A rainbow appears in the mist launched by the whitecaps, its feet anchored in the sea. All this is somehow reduced to a video on the flat-screen windows of thick, salt-frosted glass, bolted in place in tracks of steel. Like most people, I feel particularly vulnerable when an aircraft hits turbulent air. Not here. Here, I am insulated from the chaos inches away by the fortress of this mighty ship. Day 5: QM2’s social director, Tommi Baxter-Hill, leads my wife, Candy, and me to a special crew area near the stern. It is a somber moment for us. Joe Scott – my former business partner, a talented writer, author and above all a dear friend – had died in September. 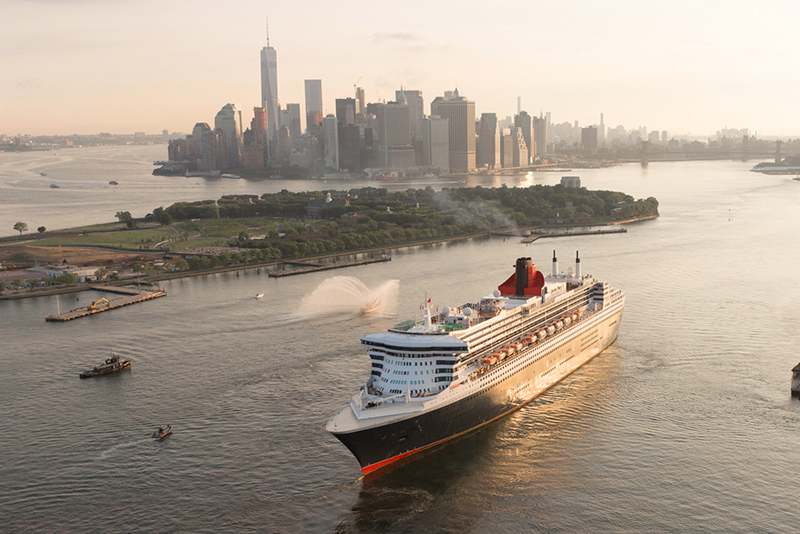 His wife, Priscilla, had introduced us to Cunard when she was VP of the company’s public relations in the 1990s. The memorial service was scheduled to occur while Candy and I are on our crossing, so we cannot be there. Cunard has made special arrangements for us to take part in absentia. On this, during the time of the memorial, we say words to honor Joe, then each toss a rose overboard. Day 8: I awake on the morning of the first full day of our westbound return voyage, with the sun shafting through the clouds as if a scene in one of those cinemascope Bible epics of the 1950s. I am confused, not so much by the celestial beauty but the realization that the sun is, well . . . on the wrong side of the ship. The captain is on the PA presently announcing that the ship has done a one-eighty. A passenger had fallen ill, and the ship is close enough to the Scilly Isles, off the southwest coast of England, to allow for a U.S. military helicopter to airlift the passenger there. I can hear the sounds of the chopper in the distance beyond our balcony. The event reinforces the sense that, beyond being the ultimate floating resort, this ship can deal with any contingency. The first time Candy and I made the transatlantic crossing with Cunard, aboard Queen Elizabeth 2, in 1995, our only criticism, shared by many fellow passengers, was at 4-1/2 days the voyage was too short. 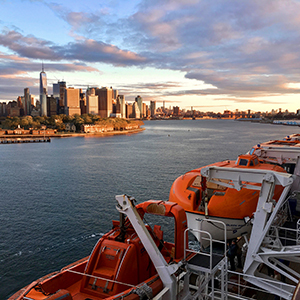 On a Cunard crossing, the journey is the destination. Candy and I had done the eastbound crossing on the Queen Mary 2 in August 2015. 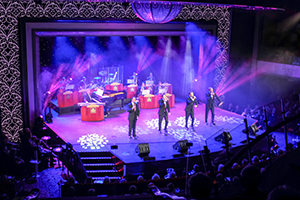 I wrote about it in Crossing The Atlantic In Style Aboard Cunard’s Queen Mary 2. Early in 2016 the ship completed a $132 million remastering and was placed back in service that June. We admitted we couldn’t get enough of the ship on the journey last year. So we used our need to find out what had changed as an excuse for another turn. On the other hand, we couldn’t think of what we’d want changed. We were relieved to discover that of the things we liked best, basically “unchanged” appeared to be the case. There were still the perfectly mixed cocktails in the Grills Lounge. The Queens Grill dining experience – the wait staff, the sommelier, the cuisine – were still absolutely first-rate. Furthermore, from the eggs benedict at breakfast to the wild mushroom risotto at lunch, to dinner of chateaubriand or rack of lamb finished off on a flaming grill atop the serving table, to name just a few of many choices, everything was perfect. The Verandah restaurant had replaced the Todd English, but the seven-course dinner was every bit an equally worthy gourmet experience. A selection of 486 wines was available for all meals, although the Chateau Petrus was out of our price range. The skilled personal butlers, concierge teams, and dining-venue wait staff are also graduates of Cunard’s White Star Service Academy. Still, accents identified staff members from all over the world: our cocktail waitress from Poland, our waiters from India and Serbia, the maître d’ from Turkey, our butler – yes, butler – born in Chile, raised in Costa Rica. All things considered, the choices of activities, detailed in the daily programs, were dizzying. There were shows from Shakespeare to Broadway to classical music recitals; dance lessons by day/dancing by night. Clubs featured music of a harpist, string quartet, singer/pianists, Dixieland, and jazz. Furthermore, there were arts and crafts programs and impressive artwork for sale. 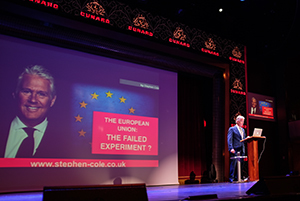 In addition, Cunard’s lecture series in its two-story Royal Court Theatre was a highlight. Its subjects, for example, included “The Shadow of the Caliphate,” “European Union: The Failed Experiment?” “The Unknown Hillary Clinton,” “Elizabeth at 90,” all by world-renowned experts. 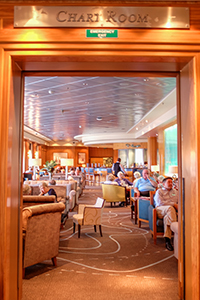 “If I had to choose one word to define QM2, it would be ‘class,’” I remarked. “Elegant,” he countered. He is, after all, British. 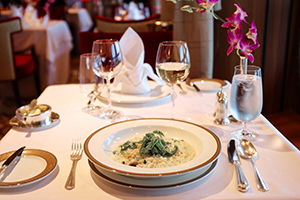 By and large, class is evident throughout Cunard’s history. It is reinforced in photographs on the walls of lower decks. 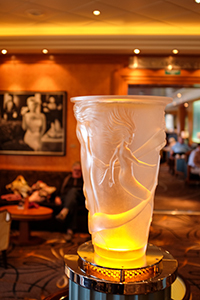 It is on the photographed faces of the celebrated that traveled with Cunard during the golden age of steamships. Cary Grant, Loretta Young, Bing Crosby, Rita Hayworth, David Niven, Audrey Hepburn, Clarke Gable, Liz Taylor, Burt Lancaster, Marlene Dietrich in furs, Deborah Kerr with her family. Men in fine-tailored suits, topcoats, fedoras; women in smart dresses, some in furs; children in mini versions of their parents’ apparel. The photos amplify the experience, giving you the sense that you are participating in those elegant, earlier days. 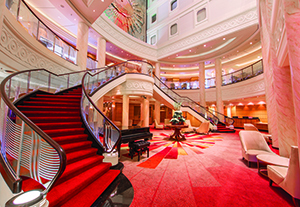 If Cunard is a synonym for “class,” QM2, the company’s flagship, is a classic. And also, by definition, you can’t redefine a classic. You can polish it up a bit, but a classic is simply that: a classic. O.K., I admit to an attachment to retro. I can’t let go of my Leica M3 – yes, it shoots film – a Royal typewriter that weighs a ton, a 1939 Emerson AM radio that needs 27 feet of antenna wire, one of those “fat boy” microphones Elvis loved. I’ve watched “Casablanca” countless times. Moreover, I like putting on a tuxedo and staring across the table at my wife, stunning in her floor-length gown. When F. Scott Fitzgerald had won fame and a degree of fortune with the publication of “The Great Gatsby” in 1925, he and his wife, Zelda, compiled a short list of things they would like to do with their newfound largess: a Picasso etching, a dress “as green as wet paint,” a second-hand luxury touring car, two first class tickets on the Aquitania, Cunard’s flagship at the time. Of course friends have questioned why we would choose a cruise without ports of call. Our answer always has been we couldn’t think of any reason to get off. In any case, if you appreciate iconic things that stand the test of time, this ship – this journey – is the place for you. The experience just keeps getting better. Again next year, Candy?